Already own a home in the Woodlands Fairhope subdivision? Thinking of selling? Click here and read about current search trends & our web network. The Woodlands Fairhope is a community off of Hwy. 98 and near its intersection at 104. The subdivision is approximately 1 mile East of Mobile Bay and in between Fairhope, AL and Daphne, AL. The homes in the Woodlands range in size from 3,100 to 5,300 square feet. Woodlands Fairhope is a great subdivision close to many of the Eastern Shore's great dining, shopping and entertainment venues. There are 2 regional airports in the area and these homes are a 40 minute drive from both. Another great feature of Fairhope is its proximity to the beautiful white-sand beaches of the Gulf of Mexico in Gulf Shores and Orange Beach. Fairhope has consistently been voted one of the best places to live in America. If you need further info, have questions or would like to schedule a viewing for any of the homes for sale in the Woodlands Fairhope or any other properties in the area, please email info@condoinvestment.com or call 251.Area.Pro (251-273-2776) for immediate assistance. 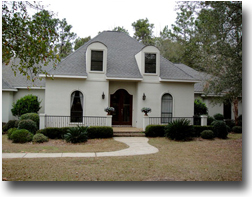 Woodlands of Fairhope is approximately 10 miles south of I-10 making trips to Mobile and Pensacola, FL quick and easy. It is less than an hour drive to reach the gulf coast beaches when using the Baldwin Beach Express. Gulf Shores is a popular family vacation destination with numerous attractions including entertainment venues, seafood restaurants, and state parks. Our Gulf Shores condos for sale page offers comprehensive information for buyers and investors and provides helpful real estate data including revenue info for all condos, and recently sold condos with actual sold prices and closed dates. Our Orange Beach condos for sale page offers the same information and other helpful features including pre-defined search options and aerial imagery to make it easier to browse for condos and other real estate properties. Use Condoinvestment.com to research information for condos and homes from Mobile, AL to Panama City Beach, FL.